Sideways #10 Review – AiPT! In the wake of his mother’s death, Derek learns that home is where the hell is. If all goes well, a comic book is meant to continue throughout years, telling new stories and exposing heroes and villains to new stories, allies, enemies and most importantly experiences, both internal and external. If nothing else, Sideways #10 marks the beginning of a new chapter for Derek both personally and heroically. 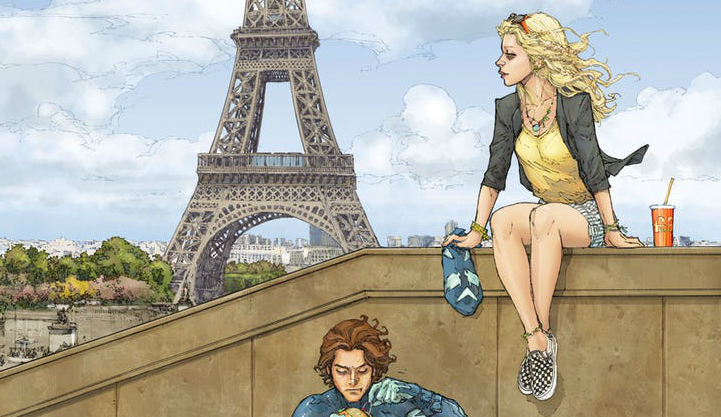 Dan Didio and Grant Morrison have been building Sideways into a full-fledged hero. It would be premature to categorize Sideways as a significant player in the DC universe, but his eventual place in DC lore feels well assured. Like any fledgling hero, Derek James struggles with the choking responsibilities of heroism, the juggling act of balancing his dual identities and finding the courage to continue what feels like an uphill battle. The issue doesn’t reinvent the wheel regarding comic lore. However, elements from previous arcs are coming to a head. The narrative seeds planted in earlier issues are beginning to blossom. After having missed his mother’s funeral and narrowly escaping an alternate dimension, Derek returns home to his father, who believed he was missing. What should be a reunion of father and son quickly sours into a disturbing revelation; Derek’s father never wanted to adopt him. With Derek’s mother gone, his father no longer knows where they stand. The exchange was brief but powerful. Without a doubt, this was the highlight of the issue. Sideways has fought villains, venomous spiders, and survived dark dimensions; yet, the severest blow he receives comes from within his home. I’m eager to see how Didio explores this relationship going forward. With his personal life in disarray, Derek escapes to his Sideways persona. Sideways finds solace in his Ernie; his best friend, confidant, and sounding board. Sadly, Ernie’s family life is equally as dismal. Derek learns her folks are divorcing, spurring the friends to take a trip to Paris. What begins as a heart to heart over their mutual woes slowly turns into a romantic exchange. From the very first issue, the idea of Ernie as a potential love interest for Sideways lingered. She’s beautiful, relatable, and possesses a nurturing disposition. Smartly enough, Didio doesn’t dive right in with a passionate kiss, but only the touch of a hand, keeping the “will they, won’t they” thread open. The moment is interrupted when terrorists attack Paris. If the first two arcs of the issue focused on Derek’s personal life, the final arc slams readers headfirst into Sideways’ world of metahumans and danger. After all, villains don’t put things on hold to allow heroes to catch their breath and mend their personal lives. Sideways remains on Dark Star Sciences’ radar; if Leto has her way Sideways is rife for scientific discovery. Super-Assassin Bolt is tasked with bringing Sideways into Dark Star Sciences. It can be a trope for a hero to face a villain similar to his or her self, a dark reflection of themselves. Bolt is precisely that, within one form of his introduction readers are quickly informed –through clear exposition – that Bolt has the very same powers as Sideways. The issue ends on a cliffhanger that doesn’t feel forced. Instead, it feels like it came at the exact right moment. Thankfully, former series regular artist Kenneth Rocafort returns to art duties. It may be stubborn of me, but with only ten issues under the characters belt, it feels unnecessary to change what works. His unique style of art is expressive, with a slight touch of surrealism. He can whip together fun action filled panels with interesting camera angles, but more importantly, his characters emotive expressions are on point. A necessary tool to have in an issue with such raw emotion. Sideways #10 won’t be the issue fans are clamoring over, but it manages to juggle three plot points and combine them into one captivating cliffhanger; satisfying previous plots and introducing new obstacles. Focus is placed on the personal relationships in Sideways' life.